Fraserburgh FC won their second successive game on Saturday as they beat Rothes 2-0 at Bellslea Park to regain some of their momentum. Before the previous weekend’s win over Formartine, the Broch had lost two league matches, and they were looking to build on the victory over the men from Pitmedden. Goals either side of half- time secured them the win over Rothes, with Paul Campbell opening the scoring on 42 minutes and Sean Butcher doubling their advantage and securing the three points 68 minutes into the match. The win kept Mark Cowie’s side in third in the Highland League table and allowed them to close the gap on top- placed Brora Rangers and second-placed Cove Rangers, who drew 0-0 with each other on Saturday. The Broch are just three points behind league leaders Brora but have played two games more and are the same amount of points behind second-placed Cove but have played four games more. In the weekend’s other games Clachnacuddin won 1-0 at home to Buckie Thistle thanks to a late Martin Callum winner while Formartine were 3-0 victors at home to Keith with Andrew Greig, Ryan Stott and Garry Wood all getting on the scoresheet. 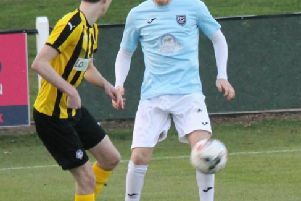 There were also home wins for Forres Mechanics who beat Huntly 4-0, Strathspey who were 1-0 victors over Lossiemouth and Wick Academy who won 2-1 over Turriff United. In the Friday night game at Harlaw Park, Inverurie Locos beat Deveronvale 2-0. This Saturday the Broch are back on the road as they make the trip up the coast to Victoria Park to face Buckie Thistle.